So I get to the end of the soon-to-be-released extremely impressive release by Young Hov and I find myself in awe of the last song. Ya know when you get that nostalgic feeling when you hear a track and it immediately takes you back to a great memory or a time when you were living in the moment? Sort of like a mental bookmark that you associate with a song because it takes you back to that fond memory. That's exactly the feeling I got when hearing this track. It's pretty cool the original group Alphaville, a German, 80s electro-pop group, released this song 25 years ago, just before I was born. Other than the verses and a little heavier beat, there isn't much difference at all from the original song. I'm very happy Kanye didn't change much on the beat, all he did was add a Hip Hop twist by augmenting the track with his familiar extremely subtle, raspy beat. But...you have gotta give credit where credit is due and I will compliment Jay-Z for being resourceful in using Mr. Hudson on this track. Mr. Hudson, armed with his British accent sounds identical to Marian Gold (the lead singer of Alphaville). After hearing this I'm about to start a conspiracy theory that Jay had Kanye recruit someone who could do this sample to a T.
Alphaville - Forever Young Classic! 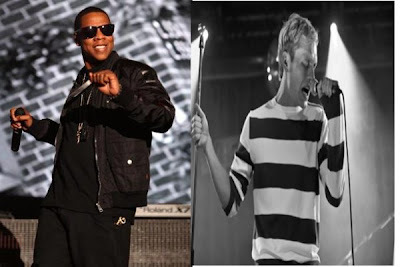 Jay-Z feat Mr. Hudson - Young Forever (prod by Kanye West) Top Song of August! GWDJ Verdict: This is the type of timeless track that you have to do right if you're going to sample it. All things considered I don't think it could have been sampled any better and Jay-Z has definitely created an equally timeless version of an age old track. My hat is off to you Hov, take a bow, you made it your own by adding three lyrically introspective verses, while still maintaining the feel of the original song. In my mind Hov and Kanye, you absolutely did the song justice . Did Jay-Z and Kanye do Alphaville's sample of Forever Young justice?